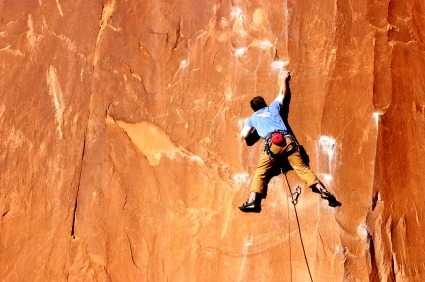 The type of rope chosen by a rock climber can have a dramatic effect on the safety and success of his or her ascent. Every climbing rope has a distinct set of uses, benefits, and drawbacks. While some ropes may be tailored to a slow, complex, and dangerous climb, others may be suited to a safer, simplified, and more efficient ascent. Furthermore, the disparities between these various rope types often appear subtle to the casual observer; however, the effect of such small distinctions can be significant. 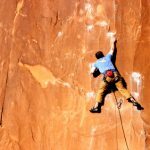 For this reason, it is imperative that rock climbers of all skill levels carefully evaluate the requirements and difficulty level of a climb before choosing the appropriate rope. On a fundamental level, rock climbing ropes are divided into two major categories. Of these, perhaps the most frequently used is the dynamic rope. The primary feature of the dynamic rope is its ability to stretch when forced downward. Different dynamic ropes may stretch at varying rates depending on the weight of the climber and the load he or she is carrying. The value of the dynamic rope’s stretching capacity cannot be overstated; if a climber were to fall from a significant height and his or her rope remained taut and unyielding, the fall’s impact could easily break the back of the climber. The dynamic rope’s ability to absorb the force of such a descent reduces the risk of these injuries. Alternatively, the second basic type of rope—known as the static rope—is not designed to provide such protection. Since it has no stretching capability, the static rope is not recommended for most types of rock climbing. Instead, this rope is often used when embarking on the safer categories of climbing, such as rappelling or top-roping. By utilizing the static rope during these exercises, the climber ensures that his or her dynamic rope will not wear out too rapidly. Moving beyond these basic categories, rocking climbing ropes are also distinguished by their number and thickness. To begin with, climbers use the single rope in a broad variety of circumstances, depending on the length and thickness of the rope. Single ropes tend to be as thick as 11mm and around 50 to 60 meters long. Although it is generally true that thicker single ropes are also stronger, this is not always the case; the quality of the craftsmanship and the materials used also play an important role. With this in mind, it is likely beneficial to research the reputation of a single rope before committing to your purchase. While the single rope may be adequate on a straightforward, moderately dangerous climb, it does possess a number of drawbacks. Most evidently, attaching yourself to a single rope increases the risk of injury; if this rope happens to suffer a cut, you have no alternate rope to serve as a backup. Secondly, the single rope may cause the climber to use an excessive amount of zigzagging anchor points, thereby decreasing the speed of the climber and increasing the burden of the equipment. For this reason, many climbers prefer double ropes. Double ropes, also known as half ropes, allow the climber to run two ropes in parallel with one another, allowing climbers to access the nearest rope at each anchor point. However, since the ropes are placed separately, only one rope will support a climber in the event of a fall. If you wish to have the strength of two ropes simultaneously, twin ropes are the best option. These ropes, unlike the double, are threaded through each piece of equipment at the same time. In addition to these basic rope distinctions, there are many site-specific options that a climber should consider. For example, if you suspect that your climb will lead you into icy or wet conditions, it is necessary to purchase a rope designed to absorb the water you will encounter over the course of your climb. If you have any questions about the climate of the area in which you wish to climb, it is always best to proceed with an abundance of caution. Armed with the best available knowledge and equipment, it is much easier to relax and simply enjoy your ascent.